We almost had an all ladies band! (Emma couldn’t come to Isle of Dogs). Back L to R: Piers, Buky, Anna, Justina, Lina, Front: Bo, Lily, Naoko. The peal board in the background is the first peal rung by an all ladies band. Success is the Reward for Perseverance! The bands at Isle of Dogs and Greenwich work closely together, especially as we have a fair number of new ringers, and the two towers are only 15 minutes walk apart. As one service starts at 10am and the next at 11am, we can easily ring for both morning services. Today we were able to ring rounds and call changes on the front six at Greenwich and all eight at Isle of Dogs. What is remarkable is that of the ten ringers today, four have only learnt in the past six months, and two more have been ringing for less than a year. Never the less they are all making excellent progress towards Levels 2 and 3 of Learning the Ropes. Isle of Dogs is the tower where the first all ladies band rang a peal, back in 1912. We look forward to further progress and to the day, in the not too distant future, when at least some of our new ringers also ring their first peal. ‘Success is the Reward for Perseverance’ as the motto on the peal board says! 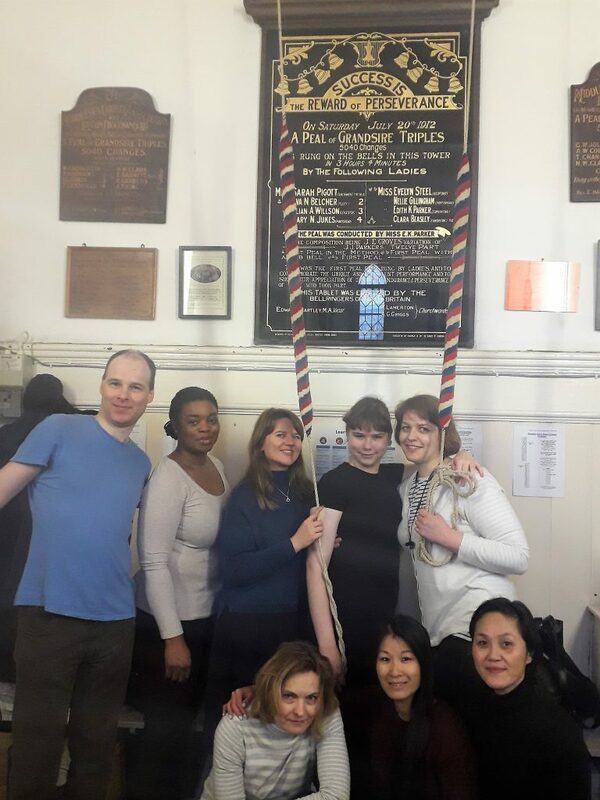 This entry was posted in News, Training, Uncategorized and tagged ART, bellringing, docklands ringing centre, Greenwich, Isle of Dogs, learn to ring, Learning the Ropes, New ringers on 7 January 2018 by Roger.